P RO G R A M N OT E The ideas, themes, and experiences that make up Cycles of My Being have been on my mind for quite some time. As I’ve watched men of color endure undeserved aggression, incarceration, brutality, and even death, I’ve been forced to consider my thoughts and questions around what it means to be a black man in America today, and how we as a people are viewed and treated. Working with Terrance Hayes and Tyshawn Sorey – two extraordinarily insightful and talented black men at the pinnacle of their respective art forms – has allowed each of us to bring our different perspectives to this piece, and to find a common ground in both our shared cultural history and the unique individual paths that have brought us to this point. Together, we have tried to create something that speaks to the day-to-day life of a black man in the United States, and the thoughts and questions he experiences as he moves through the world. These are divided times. But the goal of this piece is neither to widen those rifts, nor to re-open old wounds; the goal is foster mutual respect, understanding, and communication across races and generations. History unfolds in cycles, and with this work, we hope to balance the stark challenges of our present reality with a resolute resilience, and an unwavering hope for a better future. Mr. Joyner & Mr. Miller Ride on, King Jesus! 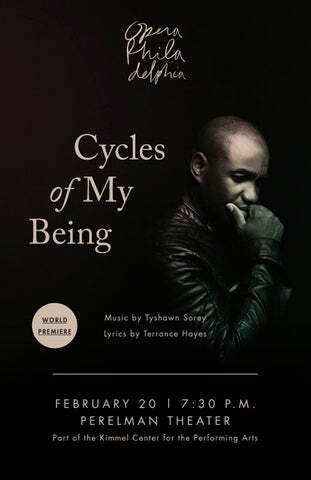 Commissioned by Opera Philadelphia, Carnegie Hall, and Lyric Unlimited: A Division of Lyric Opera of Chicago Support for Cycles of My Being provided by the Howard and Sarah D. Solomon Foundation. Support for Lawrence Brownlee provided by Ann Ziff and by Beth and Gary Glynn. C Y C L E S O F B E I N G lyrics I. Inhale, Exhale America – I hear you hiss and stare Do you love the air in me, as I love the air in you? Black boxes of cargo Black boxes in holes Hysteria, Hysteria – I hear you hiss and stare Black eyes and blackouts Blackjacks and nightmares America – do you care for me, as I care for you? Do you love the air in me, as I love the air in you? II. Hope (pt. 1) When walking hope is a swagger When breathing hope is oxygen When drunk hope is wine When dirty hope is water When unfilled hope is a well When unwell hope is medicine When impatient hope is patience When lonely hope is company When poor hope is money When hungry hope is meat When hunted hope is a knife When sleeping hope is a lullaby When angry hope is a blade When wounded hope is what heals me. III. Whirlwind Lord, I’m trying to break myself open; this song of mine wants to be a whirlwind. You are both religion and assassin. I am both assassin and religion. My armor is made of flesh and spirit. I am your story. I am your lyric. Lord, I’m trying to break free of prison; this song of mine must become a weapon. You are both compass and situation. I am blindness, rumor, insight, vision. My courage is made of flesh and spirit. I am your story. I am your lyric. Lord, I’m trying to break free again. This song of mine is made of love and skin. This song of mine must become a weapon. This song must become a whirlwind. IV. Hate Tell me, what causes one to hate? Hate takes on many shapes. It is subtle, overt, passive, often wrapped in disguise. Hate wears white sheets, black suits, high heels, and boots. Hate is powerful, all encompassing, and enrapturing. Tell me, could it be that you hate me because you hate yourself ? The very essence of me you despise. But why, when I am in the state your ancestors helped create? …and that, being magnified, only breeds more hate. You don’t know me. Still you hate me. C Y C L E S O F B E I N G lyrics cont. Your contempt for me does not allow you to see me for who I am. I am Godâ&#x20AC;&#x2122;s creation, flesh personified, in His image. You hate the God in me, and the God awful too. You donâ&#x20AC;&#x2122;t know me. Still you jeer me. Your hate becomes a shackle you cannot break. You nor I are born with hate, but hate flourished because you chose to cultivate your hatred. Your hate lies in wait until you choose to activate hate. Make no mistake, hate leaves carnage in its wake. I hate that your hate can decide my own fate. V. Hope (pt. 2) When weary hope is a hymn When uninspired hope is vision When perplexed hope is reason When unsettled hope is peace When lost hope is direction When frustrated hope is calm When unsure hope is certainty When worried hope is serenity When betrayed hope is forgiveness When depleted hope is reserve When dancing hope becomes grace When fatigued hope is a second wind When dead hope is life. VI. Each Day I Rise, I Know Each day I rise, place foot to floor the weight of consciousness I know. Each day I rise, I knowâ&#x20AC;Śto always say hello. Sun glow tooth-snow hair flow Mirror blows a flute of crows Each morning glow at the window I have something to praise Sunbreak toothpaste hair glaze Mirror gaze a flute of blue jays Moaning, amazing & misbehaving Each day I rise, I know I have something to love Sun-dusk toothbrush hairbrush Mirror blush a flute of thrushes Each day I rise, I know. L A W RE N C E B RO W N L E E Named 2017 “Male Singer of the Year” by both the International Opera Awards and Bachtrack, American-born Lawrence Brownlee has been hailed by the Associated Press as one of “the world’s leading bel canto tenors.” Brownlee captivates audiences and critics around the world, and his voice has been praised by NPR as “an instrument of great beauty and expression…perfectly suited to the early nineteenth century operas of Rossini and Donizetti,” ushering in “a new golden age in high male voices” (The New York Times). He first appeared on the Opera Philadelphia stage in 2006 as Don Ramiro in Cinderella and most recently starred as jazz great Charlie Parker in the 2015 world premiere of Charlie Parker's YARDBIRD. 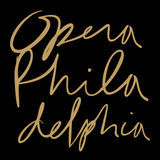 Brownlee currently serves as Artistic Advisor at Opera Philadelphia, helping the company to expand their repertoire, diversity efforts, and community initiatives. One of the most in-demand singers around the world, Brownlee has performed with nearly every leading international opera house and festival, as well as major orchestras. He is the fourth of six children and first discovered music when he learned to play bass, drums, and piano at his family’s church in Youngstown, Ohio. He was awarded a Masters of Music from Indiana University and went on to win a Grand Prize in the 2001 Metropolitan Opera National Council auditions. Alongside his singing career, Brownlee is an avid salsa dancer and an accomplished photographer, specializing in artist portraits of his onstage colleagues. A die-hard Pittsburgh Steelers and Ohio State football fan, Brownlee has sung the National Anthem at numerous NFL games. He is a champion for autism awareness through the organization Autism Speaks, and he is a lifetime member of Kappa Alpha Psi Fraternity Inc., a historically black fraternity committed to social action and empowerment. T YSHAWN S O RE Y Newark-born multi-instrumentalist and composer Tyshawn Sorey (b. 1980) is celebrated for his incomparable virtuosity, effortless mastery and memorization of highly complex scores, and an extraordinary ability to blend composition and improvisation in his work. He has performed nationally and internationally with his own ensembles, as well as artists such as John Zorn, Vijay Iyer, Roscoe Mitchell, Muhal Richard Abrams, Wadada Leo Smith, Marilyn Crispell, George Lewis, Claire Chase, Steve Coleman, Steve Lehman, Robyn Schulkowsky, Evan Parker, Anthony Braxton, and Myra Melford, among many others. The New York Times has praised Sorey for his instrumental facility and aplomb, “he plays not only with gale-force physicality, but also a sense of scale and equipoise”; The Wall Street Journal notes Sorey is, “a composer of radical and seemingly boundless ideas.” The New Yorker recently noted that Sorey is “among the most formidable denizens of the in-between zone…An extraordinary talent who can see across the entire musical landscape.” As a leader, Sorey has released six critically acclaimed recordings that feature his work as a composer, multi-instrumentalist and conceptualist including his latest Verisimilitude (Pi Recordings, 2017), among many others. In 2012, he was selected as one of nine composers for the Other Minds Festival, where he exchanged ideas with such like-minded peers as Ikue Mori, Ken Ueno, and Harold Budd. In 2013, Jazz Danmark invited him to serve as the Danish International Visiting Artist. He was a 2015 recipient of the Doris Duke Impact Award. Sorey has taught and lectured on composition and improvisation at Columbia University, The New School, The Banff Centre, Wesleyan University, International Realtime Music Symposium, Hochschule für Musik Köln, Berklee College of Music, Massachusetts Museum of Contemporary Art, and The Danish Rhythmic Conservatory. His work has been premiered at Lincoln Center’s Mostly Mozart Festival, Ojai Music Festival, The Kitchen, Walt Disney Hall, Roulette, Issue Project Room, and the Stone, among many other established venues and festivals. Sorey recently received his Doctor of Musical Arts degree from Columbia University. In Fall 2017, he assumed the role of Assistant Professor of Composition and Creative Musics at Wesleyan University, where he received his Master's degree in Composition in 2011. Terrance Hayes is a 2014 MacArthur Fellow. His most recent poetry collection is How To Be Drawn (Penguin in 2015). His previous collection, Lighthead, (Penguin 2010), was winner of the 2010 National Book Award and finalist for the National Book Critics Circle Award and Hurston-Wright award. Hayesâ&#x20AC;&#x2122; other honors include a Guggenheim Fellowship, a National Endowment for the Arts Fellowship, and a profile in The New York Times Magazine. His first book, Muscular Music (Tia Chucha Press, 1999) won both a Whiting Writers Award and the Kate Tufts Discovery Award. His second book, Hip Logic (Penguin 2002), was a National Poetry Series selection and a finalist for both the Los Angeles Time Book Award and the James Laughlin Award from the Academy of American Poets. Wind In a Box (Penguin 2006), a HurstonWright Legacy Award finalist, was named one of the best books of 2006 by Publishers Weekly. He is the current poetry editor for New York Times Magazine and has two forthcoming manuscripts, American Sonnets for My Past and Future Assassin (Penguin, 2018), and To Float In The Space Between: Drawings and Essays in Conversation with Etheridge Knight (Wave, 2018). Hayes was guest editor of The Best American Poetry 2014 (Scribner, 2014), the preeminent annual anthology of contemporary American poetry. His poems have appeared in ten editions of the series. Hayes was born in Columbia, South Carolina in 1971, and educated at Coker College where he studied painting and English and was an Academic AllAmerican on the menâ&#x20AC;&#x2122;s basketball team. After receiving his MFA from the University of Pittsburgh in 1997, he taught in southern Japan, Columbus, Ohio, and New Orleans, Louisiana. Hayes returned to Pittsburgh in 2001 and taught for twelve years at Carnegie Mellon University. He is a Distinguished Professor of English at the University of Pittsburgh. From 2016-2018 he is Distinguished Writer in Residence at New York University. Violinist Randall Mitsuo Goosby made his Carnegie Hall debut at age 13, where he “exerted a masterly level of control and lavished an exquisite tone playing Ysaye’s unaccompanied Sonata No. 3...and his performance won him a deserved standing ovation for its sheer virtuosity” (The New York Times). Randall has made solo appearances with several major orchestras across the U.S. including the New York Philharmonic, Cleveland Orchestra, Memphis Symphony, Grand Rapids Symphony, New World Symphony, Buffalo Philharmonic, Nashville Symphony, Modesto Symphony, and Arkansas Symphony among others. He has also made two solo appearances at Carnegie Hall’s Stern Auditorium as part of the Sphinx Organization’s Young Artist Development Program. In addition to performing, Randall is passionate about sharing his love for music, and has participated in outreach programs for public schools, children’s hospitals, and music programs across the country. In addition, Randall has recently joined the violin faculty of Opportunity Music Project, a non-profit organization providing free music lessons and mentorship to children from low-income families in New York City. Randall currently studies with reigning violin virtuoso, Itzhak Perlman, and Catherine Cho at The Juilliard School, where he is pursuing an undergraduate degree in Violin Performance, and a proud recipient of the prestigious Kovner Fellowship. Randall plays on a magnificent 1765 Giovanni Battista Guadagnini violin, on generous loan from The Juilliard School. Described by the New York Classical Review as “one of the most exciting young musicians on the classical scene,” Khari Joyner has a following both nationally and abroad as a versatile soloist, chamber musician, and ambassador for the arts. He has performed with the Atlanta, Buffalo, New World, New Jersey, and Sphinx Symphonies, and has collaborated with artists ranging from Magnus Lindberg, Barbara Hannigan, and Hubert Laws. non-profit management from Arizona State University’s Lodestar Center for Philanthropy and Nonprofit Innovation. Alex is fortunate to have garnered awards and honors in his career, most recently being awarded a 2018 Sphinx Medal of Excellence and being named one of Musical America’s Professionals of the Year for 2017. He has been an invited speaker to the Association of British Orchestras annual conference, was a faculty member for the 2017 National Take A Stand Festival and serves on the board of directors for Gateways Music Festival, Arizona School for the Arts and co-chairs the Institutional Readiness task force for the League of American Orchestras Diversity Forum. American pianist and collaborator Kevin J. Miller is acclaimed for his dynamically artful performances. As a collaborator, he has worked with many great artists. Past engagements include a recital with international tenor Joseph Calleja and Nadine Sierra at the Supreme Court of the United States, as well as an appearance with Mr. Calleja on NPR’s Tiny Desk Concert series. Kevin prepared soprano Jessye Norman for performances of Laura Karpman’s production of Ask Your Mama, which was performed at Carnegie Hall. He has collaborated with the internationally acclaimed countertenor, David Daniels, in a recital at the Glimmerglass Festival. He can be heard on the recording Been in da Storm So Long, which features baritone Kenneth Overton, with Kevin at the piano. In addition to his formal studies, Kevin has been a participant in some of the country’s most prestigious festivals and young artist apprenticeships that include The Tanglewood Institute of Music, Aspen Summer Music Festival, The Cleveland Art Song Festival, San Francisco Opera’s Merola Opera Program, Washington National Opera’s Domingo-Cafritz Young Artist Program and the Glimmerglass Festival. Upon completion of his apprenticeship at the Glimmerglass Festival, he was invited to serve as a vocal coach at the Glimmerglass Festival. Currently, Kevin has taken up a new appointment as Head Opera Coach of the Moores Opera Center at The University of Houston.